Vote Now for the 2017 Hambone award! 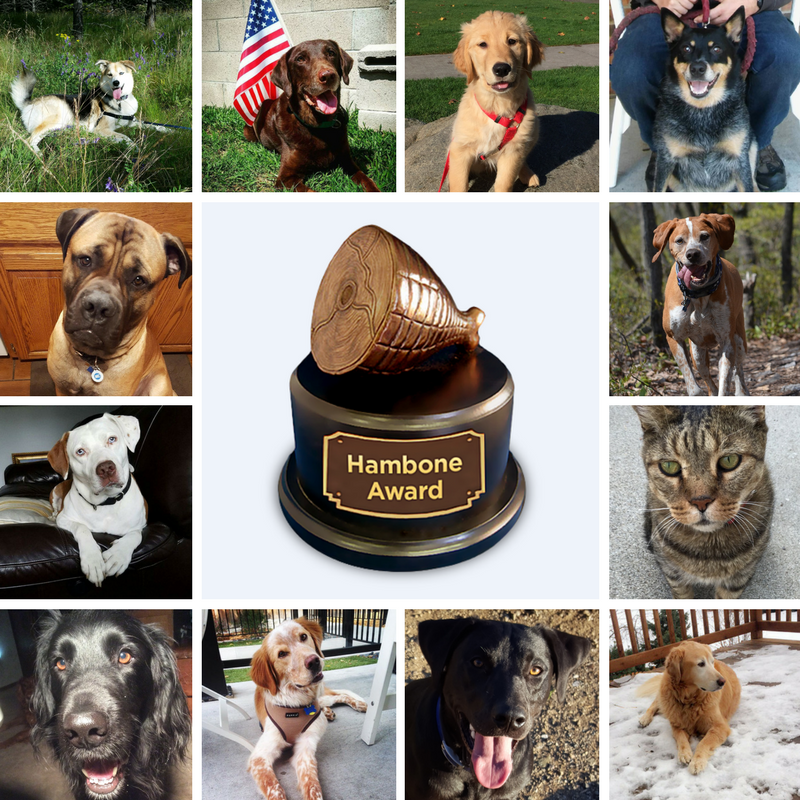 After reviewing nearly 1.5 million pet insurance claims received over the past year, Nationwide has nominated 12 worthy candidates for the 2017 Hambone Award. Each year, the nation’s first and largest provider of pet health insurance searches through its database of more than 600,000 insured pets to honor the most “Unusual Pet Insurance Claim of the Year.” The winner will be decided by a public vote Sept. 21 – Oct. 4 at www.HamboneAward.com. Muffy the Tabby cat (Sylmar, California). Muffy the diabetic cat has a strict feeding schedule, and after he missed a routine meal his owners became worried. Little did they know, Muffy had fallen down an abandoned well and wouldn’t be saved without a heroic effort from the whole family. Star the Cattle Dog mix (South Bend, Indiana). Star’s daily walks are often interrupted by her clumsiness, but a recent trailside blunder nearly ended in tragedy after she fell into a hidden manhole. Rooster the hound mix (Scranton, Pennsylvania). After a horrific incident at work, Rooster became his owner’s source of comfort and therapy, but that companionship was nearly lost after Rooster was impaled by a tree branch during a hike. Ruger the Border collie/Labrador retriever mix (Fairfield, California). Ruger was nearly killed after being run over and pinned underneath a large golf cart. Ruger was trapped under the cart until being saved by a group of local firefighters. Raja the Golden retriever (Naperville, Illinois). Raja nearly lost his life after being trapped in a house fire, but was saved by a daring rescue from his owner. Butterscotch the Great Pyrenees/Irish Setter mix (Minneapolis, Minnesota). A walk in the city left Butterscotch with shocking injuries after he stepped in a puddle that was exposed to a live wire and was electrocuted. Ruby the Golden retriever (Lakewood, Washington). Ruby’s puppy mischief nearly turned tragic after she got her head stuck in a moving elevator door, which smashed her snout. Chuter the Labrador retriever/Irish Setter mix (Fairbanks, Alaska). A backyard bathroom break nearly ended in tragedy when Chuter was attacked by a massive mother moose, sustaining life threatening injuries. Levi the Labrador retriever (Huntington Beach, California). Levi’s anxiety over the loss of a family dog caused him to start chewing items around the house, and despite his family’s efforts, Levi’s bad habit peaked when he swallowed a pair of adult pajama pants. King the Bullmastiff (Lake Charles, Louisiana). King let his sweet tooth get the best of him when he snatched a frosting covered spatula off the kitchen counter and swallowed it whole. Little did he know, the utensil would nearly take his life and lead to the removal of a portion of his intestines. Denali the Husky mix (Treasure Island, Florida). Denali’s almost lost her life after she snuck out of her yard and jumped into to a local pond where she was attacked by a huge alligator. Denali miraculously escaped by fighting off the 7 foot alligator and swimming to shore. Tessa the mixed breed dog (North Kingstown, Rhode Island). Tessa was only trying to protect her family when she charged a running chainsaw, but the incident nearly left her with amputations after she sustained deep lacerations on her legs. Originally named after a dog who ate an entire Thanksgiving ham while stuck in a refrigerator, the annual Hambone Award has since been given to the most bizarre medical claim each year since 2009. Past winners include: Kismet, a Jack Russell terrier who sustained major stab wounds while fighting off a home intruder, Curtis, a Boxer who swallowed a barbecue skewer that disappeared in his body and nearly ended his life a year later; Charlie, a Labrador retriever who became entangled with a tractor; Ellie, a Labrador retriever who gobbled up an entire beehive and its thousands of inhabitants; Lulu, a hungry bulldog who swallowed 15 baby pacifiers, a bottle cap and a piece of a basketball; Harley, a pug who ate and subsequently passed more than 100 rocks; Peanut, a dachshund-terrier mix who survived a fierce squabble with a skunk; and Winnie, a mixed-breed dog who swallowed two pounds of uncooked onion rings.